Jewish Home chairman placed in the #2 spot on Channel 2’s “Politicians of the Year” list for 2013, after Prime Minister Netanyahu. Economy Minister and Jewish Home chairman Naftali Bennett was placed on Wednesday in the #2 spot on Channel 2’s “Politicians of the Year” list for 2013. Bennett, who followed Prime Minister Binyamin Netanyahu who topped the list, was asked in turn to choose his person of the year for 2013. He chose the interpreters, particularly the United Nations interpreter who, not realizing her microphone was on, noted that the incessant emphasis on condemning Israel - for crimes real or alleged - is uncalled for and excessive. Prime Minister Netanyahu later addressed the mishap and said that “I can assure her of a job here in the State of Israel” should she be dismissed for supporting Israel. On a lighter note, Bennett also named the fake sign language interpreter at the memorial ceremony for Nelson Mandela as his person of the year. 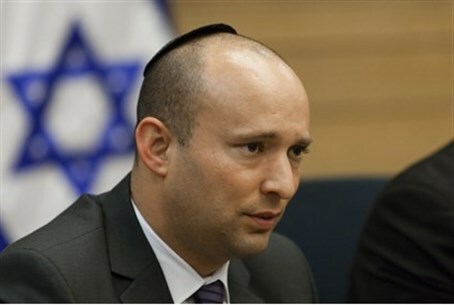 Bennett wished the people of Israel a year of security year and of lower living costs and also expressed his hope that 2014 will see Israel’s Jewish character being strengthened. “I hope that wages will start to rise and prices will go down, and that we will become a very Jewish state: that every child will know what Judaism is and come to the Western Wall and love our amazing Jewish heritage,” he said.